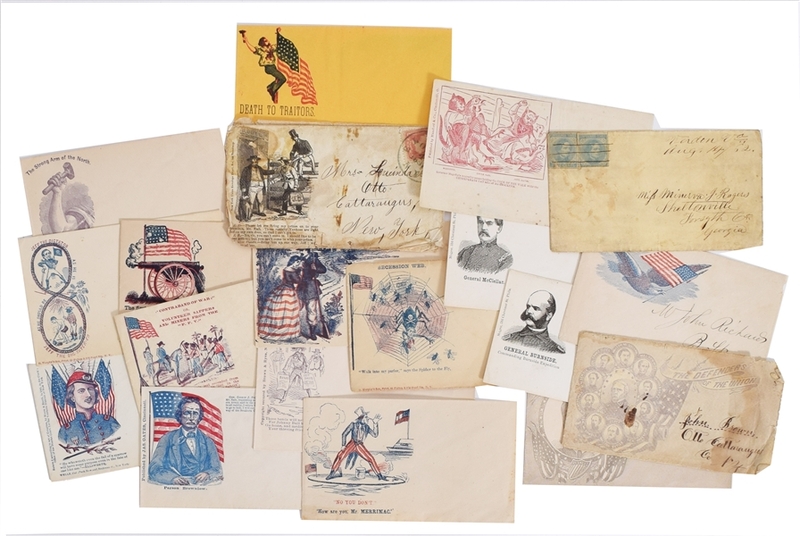 This lot offers a variety of Civil War era patriotic themes including many colorful variations of flags, soldiers, federal shields and battle scenes. Of note is a colorful image of contraband of War. Another vividly colorful image depicts the image of a spider web with Jefferson Davis as the spider with below it says “Walk into my parlor,”says the spider to the Fly” . Collection also depicts Union generals including Ellsworth, McClellan, ..and covers with Slogans like “Death to The Traitors” .Most cover measure in the 5.5" x 3.25" range, retain their rich colors, exhibit some age toning to the paper, some of the covers show evidence of glue spots on the reverse which in some cased have slightly bled through to the front of the covers, else in very good condition. Also, with collection is a fine Confederate cover of (2) Jefferson Davis 5cent stamps form Verdon, Va. August 14, 1862 Manuscript cancellation. Interesting Civil War Postal History grouping.